A policy research group says the Taliban have a significant presence in almost every corner of Afghanistan, eight years after their overthrow by US-led forces, Press TV reported. A security map by the London-based International Council on Security and Development (ICOS) showed a deepening security crisis with substantial Taliban activity in at least 97 percent of the war-ravaged country. The council added that the militants now have a “permanent presence” in 80 percent of the country. ICOS defined “permanent” presence as one or more attacks a week and “substantial” as one or more attacks a month. ICOS noted the Taliban are substantially active in another 17 percent of Afghan territory. 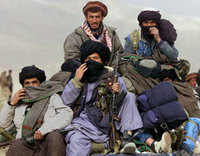 The report comes at a time as insurgency has skyrocketed in southern and eastern provinces where the US-led forces have lost several grounds to the Taliban linked militants. The insurgency has intensified in the eastern and southern provinces. The US-led forces in Afghanistan lost 77 more troops in August, setting a new monthly record since the invasion began in 2001. Based on the report, insurgent attacks have increased dramatically across northern Afghanistan as well. The developments also come after 125 people, many of them civilians, were killed and scores of others injured on last Friday. NATO warplanes targeted stolen fuel tankers on orders of a German commander in the northern Kunduz province. Kunduz was once considered relatively safe. More than 140 Afghan civilians were killed in a series of US airstrikes in the western Farah province in early May. More than 1,000 civilians have lost their lives either in US-led air strikes or in the Taliban-led insurgency across the violence-wracked country in the first half of the current year, according to a UN report. Civilians have been the main victims of violence in Afghanistan, particularly in the troubled southern and eastern provinces. The UN also noticed that the number of civilians killed in the Afghanistan conflict has jumped 24 percent so far this year. The frightening picture comes at a time when the chief prosecutor at the International Criminal Court (ICC) says investigators are studying evidence of alleged crimes against humanity in Afghanistan. Media reports said the North Atlantic Treaty Organization — which includes US and other western troops — could potentially become the target of an ICC prosecution. The group further warned of a power vacuum if Afghanistan’s presidential election goes to a runoff. Political uncertainty and civilian causalities have increased pressure on the US and its western allies to pull out troops from the violence-wracked country.